Although most of my success is with the traditional free-to-play (F2P) in-app purchase business model, the big opportunity will be on layering additional monetization on this model. One old model that I think represents a great opportunity for casual games is the subscription model, a model that pre-dates online gaming. A recent article on Alist, Subscriptions Reborn for Gaming, does a good job summarizing the history and pointing to the future of the subscription model. First, it’s important to note that the subscription model is not new to gaming. The rise of MMORPGs, think World of Warcraft or Everquest, was driven by subscription revenue. At it’s peak (2010), World of Warcraft had over 10 million subscribers (most at over $20 per month). The importance of subscriptions, however, subsided with the growth of in-app purchases. Most MMORPGs moved to a mixed or purely F2P model. Now. World of Warcraft is the only major product that is largely subscription based, and it offers free play up to level 20. While gaming has moved away from subscriptions, it is increasingly important for other online businesses. Amazon Prime, Amazon’s streaming media and free delivery service, with over 50 million US subscribers and about 80 million worldwide. Music has evolved from selling albums or singles to subscription services like Spotify and Pandora. DVDs sales have plummeted while Netflix now has over 80 million subscribers. Thus, in other entertainment spaces, the subscription model is driving revenue now. While not many games are offering subscriptions, yet, many gamers are already subscribing. Microsoft and Sony both have tens of millions of subscribers to Xbox Live and Playstation Network, respectively, for access to multi-player gaming and new, free games. Electronic Arts is seeing success with its Origin Access subscription service, which for about $4/month gives players access to classic EA games as well as new games before other customers. While there is clearly a demand for game subscriptions, one hurdle that remains is Apple’s restriction on iOS subscriptions. With Apple, to offer an “auto-renewable subscription,” that is a subscription that automatically renews rather than asking the customer to purchase it again after a set period of time, you must provide a product that cannot be used up over time, what they call a non-consumable. A consumable could be an hour-long experience point boost in a game app. On the other hand, a non-consumable could take the form of an unlocking a theme, since it could be restored again later. Look at micro-subscription, small monthly amounts. $0.99 or $1.99 is not a large burden on players but not only will it generate revenue but will get them further invested in your product. Consider multiple subscription tiers. $0.99 for the silver subscription, $4.99 for the gold. This provides opportunities for your most engaged players to get the most benefit but is also accessible for all players. If you have an in-game VIP or loyalty program, offer subscriptions for players to move up or stay at a certain level. I would pay $10/month to retain my Platinum Status on American Airlines, let other people buy into status (plus it puts a monetary reward on it for players who earned it). Decide whether it is a company wide subscription (like EA’s Origin Access) or if it is game specific. The former obviously makes sense only if you have, or plan to have, a broad range of titles. Decide what to include in the subscriptions but always test. Different options include early access to new content or games, discount on purchases (which also may include IAP monetization), special avatars or themes or a regular XP boost. The benefits are game/company specific but should be broad enough to ensure a majority of players would see value. As the model evolves, it will be interesting to see what does and does not resonate with players. By watching the space, you can learn best practices and build from there. While the subscription model is unproven in casual games and there is no defined model on how to do it right, you should still try it. It is increasingly difficult to monetize mobile apps, or at least monetize at a level that covers your acquisition costs. By adding subscriptions, you may find a secret to increasing lifetime value and thus enabling growth. Gamers have responded to the subscriptions model since MMORPGs, though it lost favor to in-app purchases recently. Other areas on online entertainment – music, film, video – are driven by the subscription model. Subscriptions represent an opportunity, though currently unproven, to increase revenue and customer lifetime value. Having traveled a lot recently, I noticed a phenomenon that presents opportunities to all companies. When companies or industries introduce new charges or fees, customers rebel. Examples include baggage and change fees by airlines and overdraft fees by banks. Customers react by switching if they have options (some industries have such fees across the industry), decreasing loyalty or just consuming less of the product. It is not a surprise that airlines are beset with bankruptcies and banks are much less profitable than in the past (hence the need for bailouts). While most of those industries argue the fees are essential for profitability, there is another option. 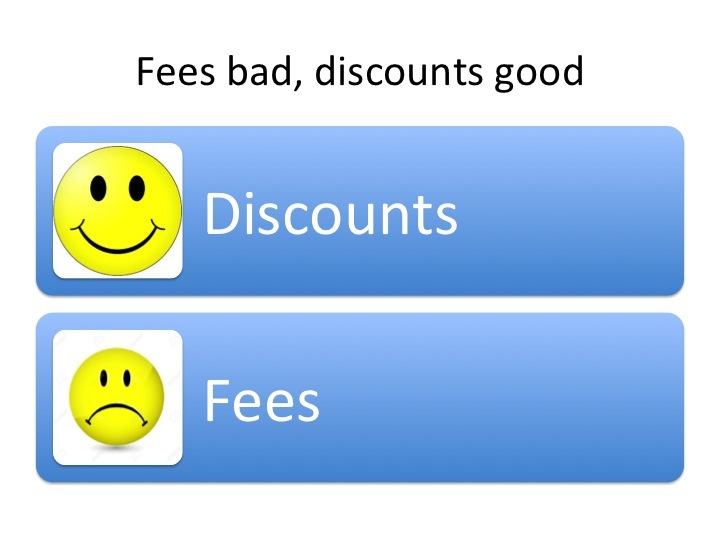 Rather than frame the charge as a fee, increase the overall price and provide incentives for the user to get a discount. Rather than charge a fee for maid service, some hotels now give customers a credit or loyalty points for waiving the maid service. Rather than being upset that they are being charged for maid service, the customer is happy that they just received a $5 credit for not having their bed made. I am sure this $5 is included in the cost of the room but the customer leaves with a better impression of the hotel than if they had been charged a fee. There is an argument that people will select the lowest cost provider regardless, and if the fee is built into the price the customer will go elsewhere, but Southwest Airlines proves this argument does not have much validity. Southwest is one of the few US airlines not to charge for baggage (and thus probably adds the cost to the ticket price), yet Southwest is the only airline to be profitable since 1971. Customers are savvy and those companies that are condescending towards them pay the price in the long-run. If you do not run an airline or hotel, you may think that there is no way to apply this understanding but that is not the case. It applies to virtually any business, particularly e-commerce. Rather than charging for overnight shipping, offer free shipping but give customers a discount if they accept standard delivery. If you have a free-to-play game, rather than charging users extra if they are not VIPs, give a discount if they join your loyalty program. The key is turn your pricing into something that enhances the customer experience. I have heard many people in the game industry complain that advertising in games (free to play or otherwise) is a bad thing, or even immoral. The reality is it is actually a benefit to people—your customers—if done properly. It provides players with more options, allows developers to create games they would not try and allows people’s favorite games to remain live. ”Watch to earn” videos or other advertising that allows players to earn in-game currency by participating in advertising rather than spending money. This often takes the form of watching video ads or participating in special offers (such as taking a survey or subscribing to Netflix. This is a huge benefit, not detriment to they player, as they control completely whether they participate in the advertising or decide not to (and either forego the benefits or use real currency to acquire them). Allowing development of advertising supported games. Some of the most popular games would not be possible if there was no in-game advertising. Virtually all of the revenue from games like Words with Friends comes from advertising. The game is incredibly popular with tens of millions of players and requires a development team to continue creating content to keep those players happy. Without advertising, those games would not exist and the millions of fans would not have a great source of entertainment. Players are always unhappy when their favorite classic free-to-play games are “sunset,” which is the equivalent of sending a horse to the glue factory. Advertising sometimes provides an alternative to euthanizing a game. If a developer can incorporate advertising to cover its costs of maintaining the game, it then has no reason to sunset the product. Most other industries embrace advertising because it provides the same benefits to users. 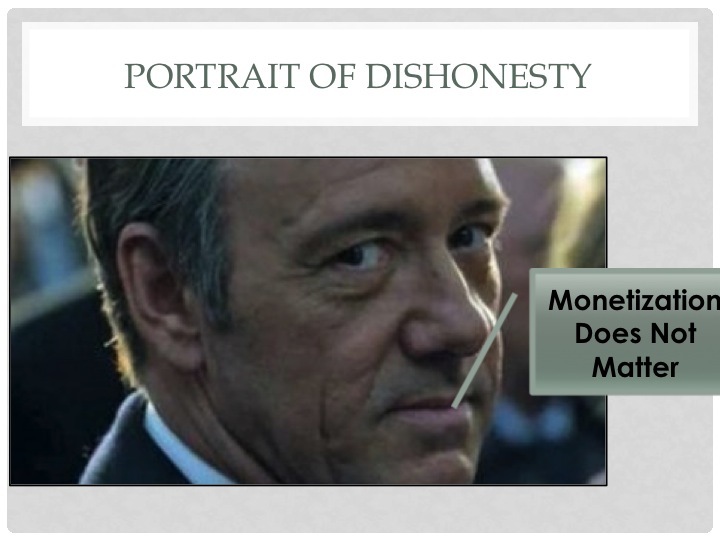 Viewers of television often prefer networks that do not charge (though they complain about it sometimes) rather than pay subscription fees. Those who hate advertising, though, have options to focus on networks like HBO or use services like Netflix. Print readers often enjoy subsidized costs for newspapers and magazines as advertising revenue allow the magazine to offset most or all of its costs. Additionally, advertising allows many publications to give away their product for free in exchange for the user to consume ads. The reality is that advertising benefits players in many ways and developers should embrace it as a way to provide more value to users. 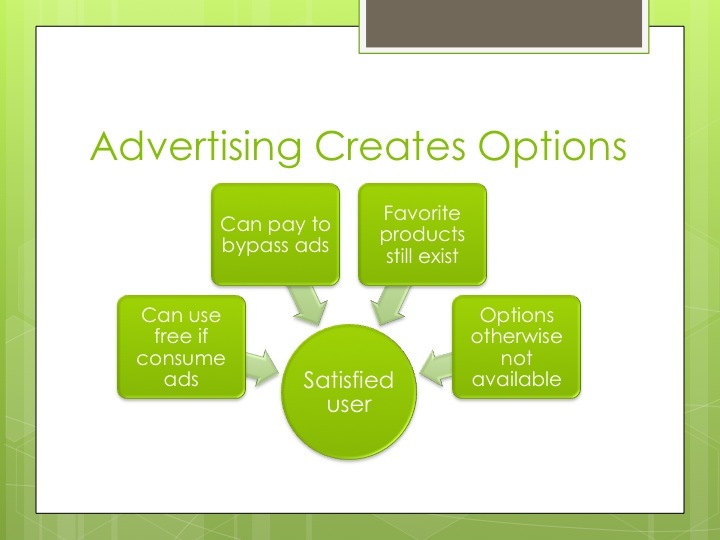 By integrating advertising into the business model, you can find ways to add value to your players and give options to players you other wise had to neglect because they did not monetize through in-app purchases. In-game advertising is a way to provide additional value to your players. It allows players who do not want to purchase items to earn them by participating in the advertising. 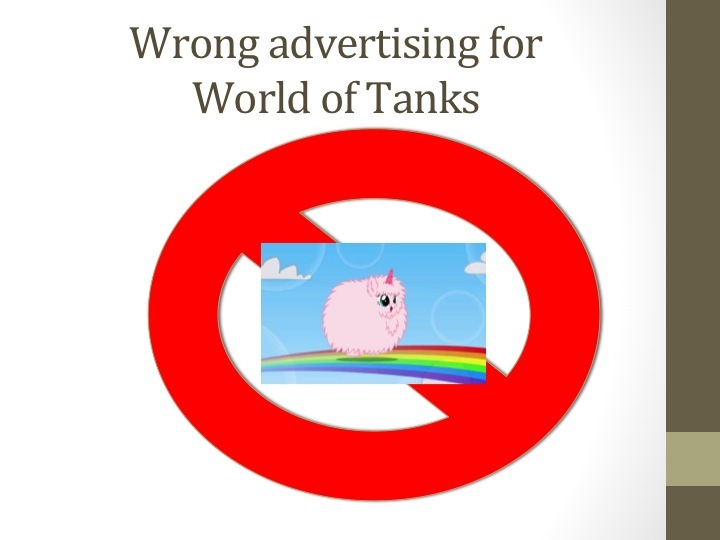 Advertising allows game companies to provide games or maintain games that otherwise would not exist. This article clearly shows why you need to focus on your best customers or VIPs,. Development, product management and marketing need to all understand the need to attract and retain VIPs. I also appreciate the fact that the post does not suggest that your revenue should be a bell-shaped distribution; as I previously wrote, there is nothing wrong with a heavy-tail distribution.